Volkswagen, which has won the manufacturer’s championship for at least the last three years in rallycross competition, announced Monday that it would campaign a pair of Beetle supercars in this year's version of the racing classic. As it has since about 2017, VW is partnering with Andretti Rallycross Beetle supercars. The cars they plan to run are veterans of the smash-and-grab style of racing where a venue is taken over, and a slice of it is dressed up with hills, steep turns, off-camber road surfaces, and the like. The exciting racing development for this season’s racing in America’s Rallycross (ARX) series is the use of Beetle supercars. With the Beetle slated for decommissioning this year as a Volkswagen model, and not slated to return, this will be the swan song for the car’s use in any racing series. Last year, Andretti Rallycross fielded two of the top drivers in rallycross racing, Scott Speed and Tanner Foust. Speed had earned three driving championships between 2012 and 2018. He helped to propel Volkswagen to the manufacturer’s championship three times in the last four years, as well. Foust has earned at least one championship himself. Recently, Speed moved from Andretti Racing to Subaru, VW’s chief rallycross rival. So far, according to reports, Speed’s debut has not been a super-success. However, it is still early in the season. Foust has yet to race as the season has not yet begun for him. 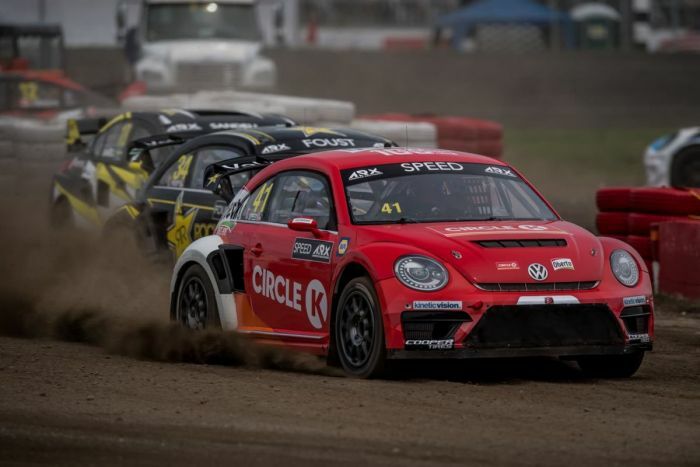 The Andretti Rallycross team will continue to race the Beetle Rallycross vehicles, built by Volkswagen Motorsport in Europe, and developed by Andretti Rallycross in the U.S. The cars will run with the same 2.0-liter 560-horsepower turbocharged engines that propelled the team to success in 2017 and 2018. Gateway Motorsports Park -- Madison, Ill. The ARX rallycross season begins and ends at the same venue, an interesting turn of events.